Growing your own potatoes at home is so easy. 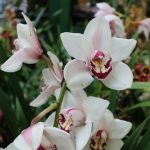 Why not grow some in containers this year? Potatoes are rewarding, delicious and nutritious and all you need to start is some seed potatoes easily purchased in any garden centre. 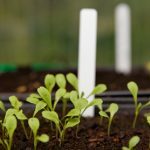 Growing them in containers offers a number of advantages over direct sowing into the ground; there’s no digging needed, plants are easier to protect from cold weather and pests such as slugs are less likely to pose a problem. There are literally hundreds of varieties to choose from but if you’re not sure what type of seed potato to grow, download our guide to seed potatoes for a full description of the characteristics of the different varieties and their recommended use in the kitchen. A seed potato is one that has grown sprouts. The correct term for sprouting potatoes is called chitting. The chits or sprouts come from the ‘eyes’ of the potato. You can plant the entire seed potato but there really is no need. If you have multiple sprouts on a potato you can cut them into sections, just make sure that you have at least one eye per piece. If you are going to cut them into sections, it is advisable to then leave them for 24 hours to allow the cut surface to dry out. This is called healing and will prevent the potato from rotting when it is put into the soil. Next up, choose your container and you can really let your imagination run riot here. 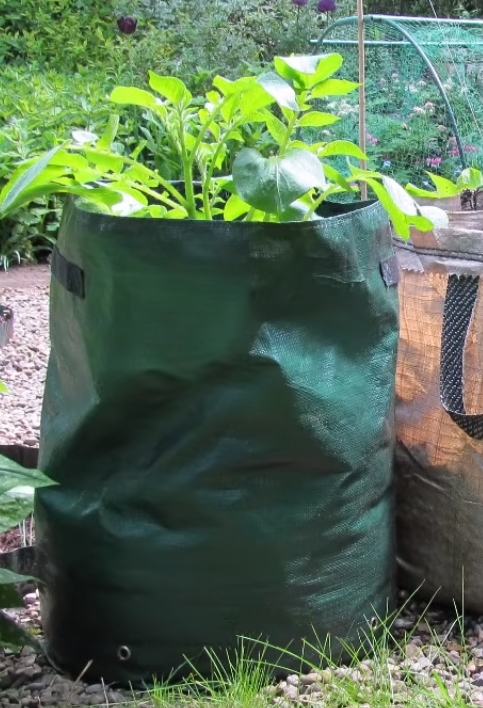 Potatoes are happy to grow in any deep container such as old sacks, bags or buckets. Just make sure you add loads of holes in the bottom for good drainage. Potatoes need a system called earthing up which is why you need a reasonably deep container. They also need a light soil that will not compact. If you have a heavy garden soil you will most definitely need to use a compost. Cover the bottom of your container with a good multi-purpose, potassium rich, compost about 6-10cm deep and place your seed potatoes or potato sections on top of this with sprouts pointing upwards. For larger potato varieties, space them 15-20cm apart or for smaller varieties 8-10cm apart. Cover the potatoes with another 6-10cm of pre-moistened compost on top. Pre-moistening the compost ensures that you don’t add too much moisture at the very beginning, causing the potatoes to rot before they have even started growing. Depending on the weather your container may need watering every 3-4 days, especially once foliage has formed, watering onto the compost, rather than the foliage. As the leaves of the potato grow they will emerge from your first layer of soil. This usually takes about 3 weeks. You want them to be about 8cm tall and then it’s time to ‘earth them up’. Simply cover them up again with another 10cm of soil and spread this lightly around the top of the container. Do not pack it down but just cover them enough so that only the tips of the leaves are showing. Carry on this process until you have reached the top of the container. The best time for starting your potatoes is about 2 weeks after the last frost date. This is usually in March, just as spring starts. Depending on which variety you have chosen they will be ready for harvesting in between 70 and 120 days. The longer you keep your potatoes in the ground, the larger they will be and the bigger the yield. We have over 20 varieties of seed potatoes in stock at Henry Street for £1.75 a kilo. Buy as few or as many as you like. How about having a potato growing competition? Choose the same size container, the same number of seed potatoes and select a harvest date – say 25th July and see who has got the heaviest crop. It’s a bit of fun and you get lovely, home-grown potatoes at the end! !